Hello all! Allow me to introduce myself—I’m the mostly-delinquent second editor of Noticing Bones, Jessa. Due to life and its complications, I haven’t managed to get a post in. (Megan has been more than making up for my slack, I think we can all agree) So I thought I’d make it up not only by posting—but by posting something that ended up WAY longer than I intended. (Disclaimer: I’m trying to adjust from academic writing to blog writing—sorry if this sounds a little too official/jargony.) Here goes? Rules, especially “appropriate” ones, are made to be broken. Arakida Rei (often called Arakida Reijo—adding the character for “woman” after her name) ignored all of them. Instead of writing diaries or exclusively poetry, like other women intellectuals, Arakida Rei wrote novels—and was the only female novelist of her time (that we know of). On top of that, she ended up feuding with one of the most prominent (male) intellectuals of her day, Motoori Norinaga. Arakida Rei was the daughter and wife of Shinto priests in the Ise region. Rei’s early studies were completed with the help of her brothers, in spite of her parents, who thought such things unfeminine. She found an advocate and ally in her foster-father, and later her husband. It was her husband who encouraged her to write novels in her forties, and several of her novels circulated in through her local intellectual community. Can I emphasize again that this is something women didn’t do? Because it was. This is when Motoori Norinaga (above) enters the picture. 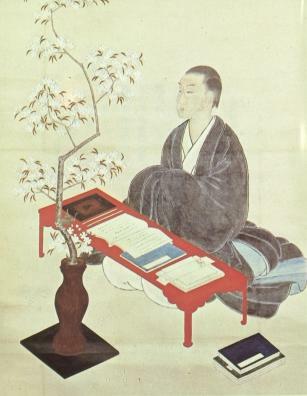 Norinaga was a prominent kokugaku scholar who advocated seeking true “Japaneseness” in the classic texts of Heian Japan. Many of the samurai that would overthrow the Tokugawa shogunate in 1868 were influenced by his school. He is sometimes known as the father of Japanese nationalism, and, as such, is one of the most studied and recognizable (perhaps infamous) intellectuals of the Tokugawa period even today. Anyway, he got his hands on a copy of one of Rei’s novels, Nonaka no shimizu (a story based on a Chinese classic that features an inappropriate relationship between a princess and a mid-ranking military official) and—completely unsolicited—decided to write a critique. The work was “too Chinese,” he argued, and the characters—most notably the princess—were acting completely unreasonably and, in his oh-so-humble opinion, just plain wrong. Rei’s response has unfortunately been lost. But it seems clear from her autobiographical account that she completely rejected everything. The dispute erupted over into local intellectual circles, and several other kokugaku scholars condemned Rei for daring to argue with Norinaga. She never gave in. 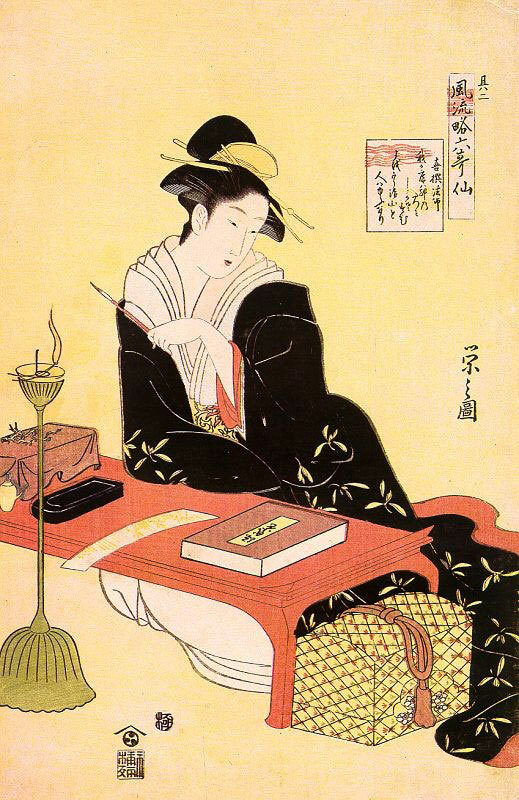 She kept writing, she kept ignoring Norinaga, and doing decidedly her own thing. It’s hard for us to see how a women writing a novel instead of a diary could be groundbreaking. But she broke all the rules, stood up to a scholar that tried to pick on her, quietly took all of her society’s expectations of women intellectuals, tidied them into a nice little pile, and stuck them somewhere in a big dark cave. Arakida Reijo. Arakida Reijo monogatari shūsei. Izuno Tatsu, ed. Tokyo: Ōfūsha, 1982. –Her complete works (in Japanese). Ishimura Yōko. “Motoori Norinaga no bunshō hihyō: Arakida Reijo no sakuhin Nonaka no shimizu o megutte.” Nihon bungaku 7 (1958): 551-561. –About the Norinaga conflict (in Japanese). Sakiko, Atsuko. Obsessions with the Sino-Japanese Polarity in Japanese Literature. Honolulu: University of Hawaii Press, 2005. —. “The Taming of the Strange: Arakida Rei Reads and Writes Stories of the Supernatural” in P. Kornicki et al, Women as Subjects. I also wrote a proposal for a project that would analyze the conflict with Norinaga both as a gendered conflict and as an analysis of the intellectual networks of Ise. Email the blog if you’re interested in reading it.